Which one of the following is NOT a property of water? Water supplied to homes is treated by local councils in water treatment plants. Which one of the following is NOT one of the stages of this water treatment? In a water treatment plant, water is treated before being sent to homes. Which one of the following is the correct order of treatment in these plants? 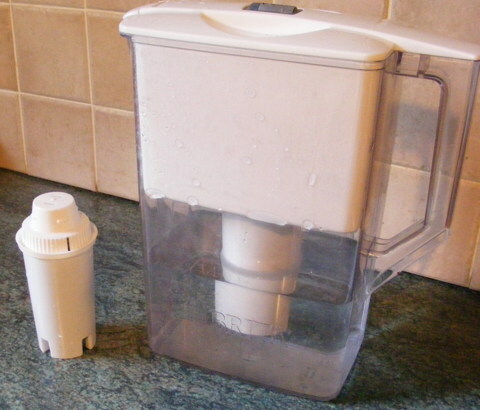 One of the treatments of water for domestic use is to allow the water into large tanks where a flocculent such as aluminium sulfate helps small particles fall to the bottom. 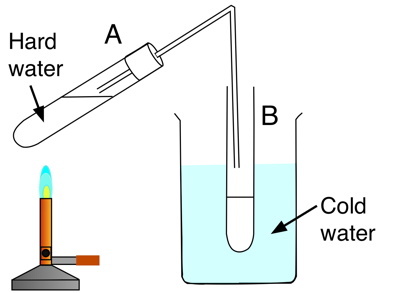 Which two of the following tests may be used for the detection of water? When water is treated at a water treatment plant, some chlorine is added to the water. In one of the stages of water treatment, a substance is added to the water in order that tooth decay may be reduced. If a beaker of water is left in a warm room for a few weeks, it is seen that the water 'disappears'. What has happened to the water? If a beaker of water is left in a warm room for a few weeks, it will be observed that the water has changed into a vapour. There wille also traces of a white solid on the inside of a beaker. The diagram shows the electrolysis of water. Why is some acid added to the water? What are gases A and B? 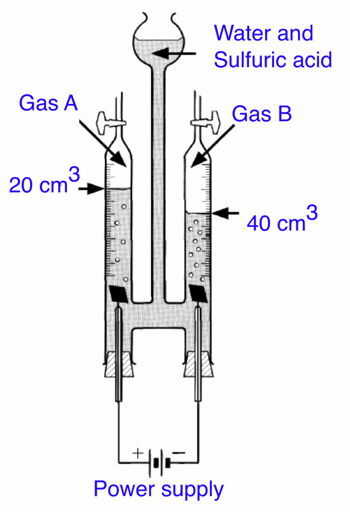 Which one of the following is a test for gas A? Flask A contains hard water. Some of this water was poured into the tube containing ion-exchange resin. The water that passed through the resin was collected in flask B. 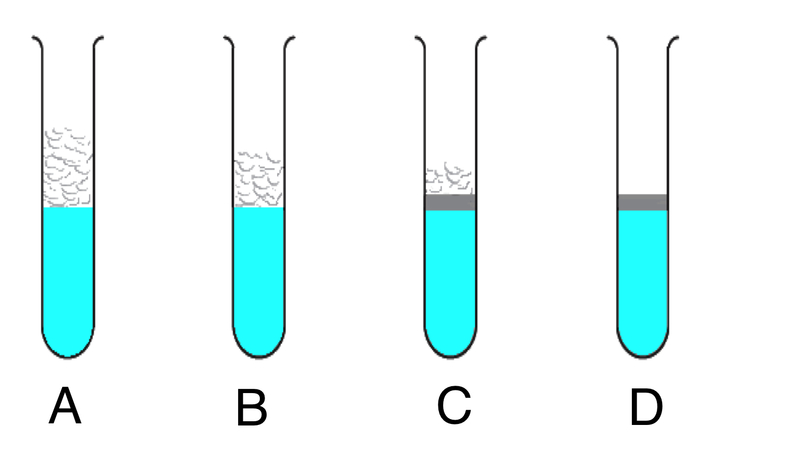 Which one of the following would you use to compare the hardness of water samples in flasks A and B? 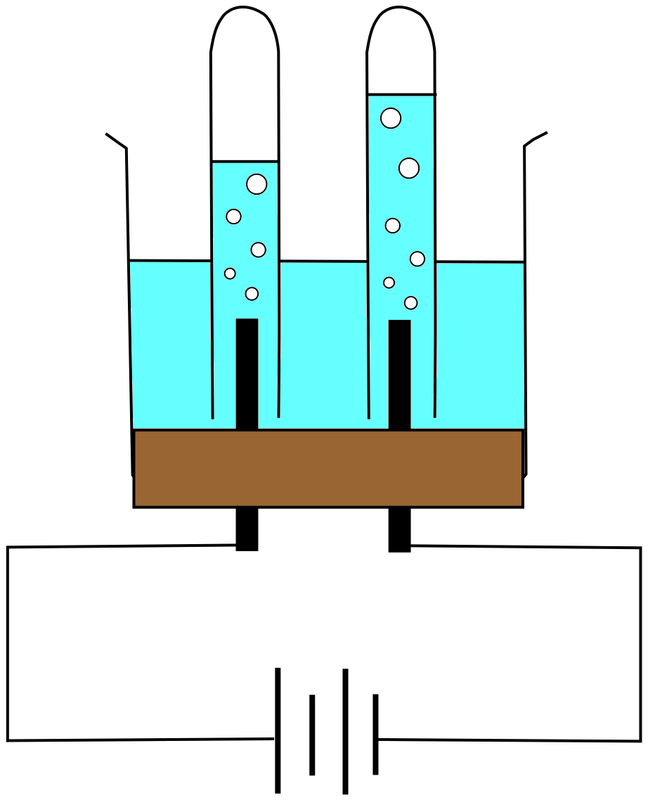 The diagram shows four test-tubes of water after 2 drops of soap solution had been added to each and shaken. Which one of these test-tubes contained the hardest water sample? Which two of the following metals, when in compound form are most likely to cause hardness in water? Which one of the following is NOT a property of hard water? 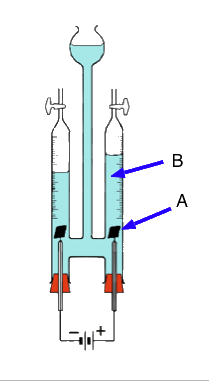 Hard water in test tube A was heated and some water evaporated from it and condensed in test tube B. The diagram shows an apparatus used to decompose water by passing an electric current through it. The volumes of gas produced by this process are shown. Gas A is oxygen and it relights a glowing splint. Gas A is oxygen and it burns with a pop. Gas B is oxygen and it relights a glowing splint. 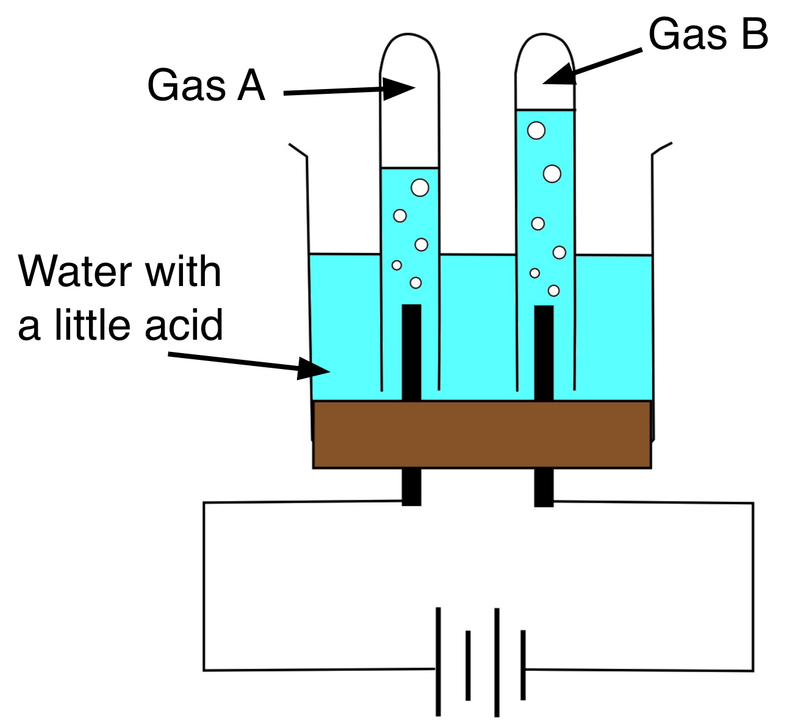 Gas B is hydrogen and it turns limewater milky. Which one of the following compounds does NOT cause hardness in water? The diagram shows a Hofmann Voltammeter. What are the parts labelled A and B? One of the methods of removing hardness from water is to use an ion-exchange resin, as used in water filter cartridges. 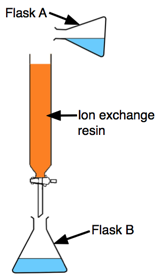 Which one of the following statements about ion-exchange resins is correct? Calcium ions in the water are replaced by sodium ions from the resin. Calcium ions in the water are replaced by chloride ions from the resin. Magnesium ions in the water are replaced by calcium ions from the resin. Chloride and magnesium ions in the water are replaced by calcium ions from the resin. When water is being treated to make it safe for drinking, the first stage is to pass it through a wire mesh. At a water treatment plant, one of the stages involves passing water through a bed of sand and gravel. Water behaves unusual at low temperatures. 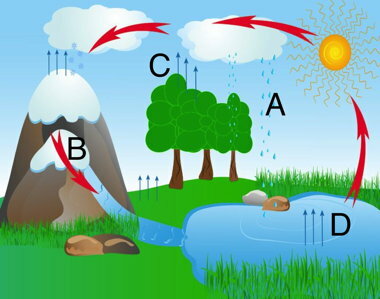 Which one of the following statements about water's behaviour is incorrect? A lake will freeze from the bottom up in freezing cold water. Water is at its densest at 4ºC. As water freezes below 0 ºC, it expands. In a frozen lake, water gets warmer as the depth increases. Two students investigated the hardness of different samples of water. They added drops of soap solution to 50 cm³ of each water sample and shook. Their results are shown. Which sample of water is the softest? 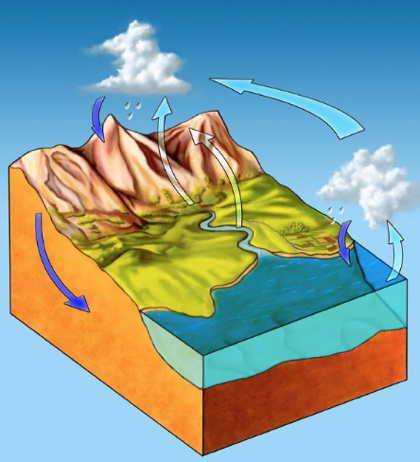 In the water cycle, what is the process by which water from the atmosphere gets back to the land and oceans?